Pacific Grove, California - December 7 1952, Barry Wilson was killed while swimming in 20 feet of water. Morro Bay, California - April 28th 1957, Peter Savino was killed while swimming in in about 10 feet of water. Baker Beach, California - May 7th 1959, Albert Kogler jr. was killed while swimming in 15 feet of water. La Jolla, California - June 14th 1959, Robert Pamperin in 30' feet of water when he was attacked and killed. Cactus Beach, Australia - 1975, swimmer bled to death after a great white shark bit off his leg. Spanish Bay, California - December 19th 1981, Lewis Boren was killed while surfing in 10' of water. Pigeon Point, California - September 15th 1984, Omar Congar was killed while diving in 15 feet of water. Malibu, California - January 26 1989, Tamara McAllister was killed while kayaking off the coast of Malibu. Maui, Hawaii - Nov. 26, 1991: Martha Morrell was killed by a shark while swimming 100 yards from the shore at Olowalu. Oahu Hawaii - Feb. 19, 1992: Bryan Adona was presumed killed from a shark attack when he did not return from bodyboarding at Leftovers, west of Waimea Bay, Oahu. The bodyboard was found the following morning with a 16-inch crescent-shaped piece missing. Oahu, Hawaii - November 5 1992, Aaron Romento, 18, was attacked and killed off of West Oahu while bodyboarding Keeau Beach Park. Pt. Loma, California - April 16th 1994, Michelle VonEmster was killed while swimming. Harris Point, California - December 9th 1994, James Robinson was killed while diving. Pringle Bay, South Africa - December 1997, Ian James Hill, 39, was standing in the water preparing to go spear fishing when he was attacked. Gonubie Point, South Africa - 1998, Anton Devos, 20, died in hospital after being mauled by a great white shark while he was body-boarding off Gonubie Point. The shark bit his hands and right calf, severing a main artery in his left thigh and causing massive blood loss. Ocean Beach, Florida - November 1998, 9 year old James Willie Tellasmon died from a shark attack while swimming 40 yards off shore at Jaycee Park. His headless and armless body was recovered the next day. Rio De Janerio, Brazil - November 1998, Claudio Roberto Florencio de Freitas, 22, was surfing after ignoring warning signs on the beach and was attacked and later died from blood loss when his forearm was bitten off. Yorke Peninsula, Australia - May 1999, 22 year old Tony Donoghue was windsurfing when he went missing. Later parts of his shredded wet suit and damaged sailboard were recovered. Buffels Bay, South Africa - July 1999, 14 year old Hercules Pretorius was killed while surfing with a friend 50 yards from shore near Cape Town. Boca Ciega Bay, Florida - August 30th 2000, 69 year old Thadeus Kubinski was swimming at a dock behind his house at about 4:00 pm when attacked. Cactus Beach, Australia - September 23rd 2000, 25 year old Cameron Bayes was in Australia for his honeymoon when he was attacked and killed by a 15 foot shark while surfing. Black Point, Australia - September 24th 2000, 17 year old surfer killed by attacking shark about 50 meters from shore. Perth, Australia - November 2000, 49 year old father of three was killed while swimming off a North Cottesloe Beach near Perth. The great white shark was estimated to be 16 feet long. Virginia Beach, Virginia - September 1 2001, David Peltier, 10, was attacked while surfing with his father and brothers. Avila Beach, California - August 19th 2003, 50 year old Deborah Franzman was killed by a great white shark estimated to be 15-18 feet long while swimming in less than 20 feet of water. Johannesburg, South Africa - November 2003, Sheldon Lee was killed by a shark while spear fishing. Maui, Hawaii - April 2004, Willis R. McInnis, 57, attacked while surfing out off Pohaku Park. He died a short time later of blood loss. Mendocino, California - August 15 2004, Randy Fry was killed it 15-20 feet of water 150 feet from shore while diving with his friend and partner. Cape Town, South Africa - November 2004, A shark estimated to be 18 foot long attacked and killed an elderly woman on her daily swim. 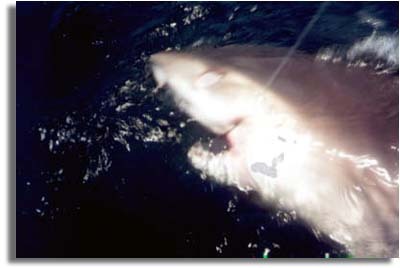 Adelaide, Australia - December 2004 two great white sharks chase and kill teen surfer. Abrolhos Islands, Australia - March 2005, a 26 year old man was bitten in half while snorkeling. The 20 foot shark was thought to be a Great White. Johannesburg, South Africa - June 6th 2005, Henri Murray, 22, was attacked and killed while spear fishing with a friend off Millers' Point near Simonstown. Destin, Florida - June 25th 2005, Jamie Daigle a 14 year old girl and her friend were swimming with boogie boards about 200 yards from shore when the attacked occurred. There were 7 fatal shark attacks in 2004.